Eleven different areas make-up the 434th Operations Support Squadron whose main mission is to support the 434th Operations Group and the Wing’s combat-ready KC-135 Stratotanker aircrews. Such activities as life support, mission development, operations training, tactics, flight management, operations plans and intelligence fall under the umbrella of the operations support squadron. Lineage. Established as 434 Troop Carrier Wing, Medium, and activated in the Reserve, on 1 Jul 1949. Ordered to Active Service on 1 May 1951. Inactivated on 1 Feb 1953. Activated in the Reserve on 1 Feb 1953. Ordered to Active Service on 28 Oct 1962. Relieved from Active Duty on 28 Nov 1962. Redesignated 434 Tactical Airlift Wing on 1 Jul 1967. Inactivated on 31 Dec 1969. Redesignated 434 Special Operations Wing on 12 Jan 1971. Activated in the Reserve on 15 Jan 1971. Redesignated: 434 Tactical Fighter Wing on 1 Oct 1973; 434 Air Refueling Wing, Heavy on 1 Jul 1987; 434 Air Refueling Wing on 1 Feb 1992; 434 Wing on 1 Aug 1992; 434 Air Refueling Wing on 1 Oct 1994. Assignments. Tenth Air Force, 1 Jul 1949; Tactical Air Command, 2 May 1951; Eighteenth Air Force, 1 Jun 1951-1 Feb 1953. 2 Air Reserve District, 1 Feb 1953; Tenth Air Force, 15 Apr 1953; Fifth Air Force Reserve Region, 1 Sep 1960; Twelfth Air Force, 28 Oct 1962; Fifth Air Force Reserve Region, 28 Nov 1962-31 Dec 1969. Central Air Force Reserve Region, 15 Jan 1971; Tenth Air Force, 8 Oct 1976; Twenty-second Air Force, 1 Oct 1993; Fourth Air Force, 1 Apr 1997-. Components. Groups. 98: 1 Oct 1987-1 Aug 1992. 434 Troop Carrier (later, 434 Operations): 1 Jul 1949-1 Feb 1953; 1 Feb 1953-14 Apr 1959; 1 Aug 1992-. 442 Tactical Fighter: 1 Oct 1982-1 Feb 1984. 908 Tactical Air Support: 1 Jul-25 Oct 1971 (detached 1-25 Oct 1971). 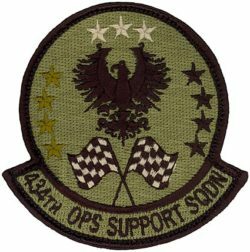 910 Tactical Air Support (later, 910 Special Operations; 910 Tactical Fighter): 21 Apr 1971-1 Apr 1981. 916 Air Refueling: 1 Jul 1987-1 Oct 1994. 917 Military Airlift (later, 917 Special Operations; 917 Tactical Fighter): 25 Feb 1972-1 Jul 1987. 926 Tactical Airlift (later, 926 Tactical Fighter): 1 Jan 1978-1 Feb 1984. 927 Air Refueling: 1 Aug 1992-1 Oct 1994. 930 Troop Carrier (later, 930 Tactical Airlift; 930 Special Operations; 930 Tactical Fighter; 930 Operations): 11 Feb 1963-13 May 1968; 18 Jun-31 Dec 1969; 15 Jan 1971-1 Jul 1975; 1 Aug 1992-30 Sep 1994. 931 Troop Carrier (later, 931 Tactical Airlift; 931 Tactical Air Support; 931 Special Operations; 931 Tactical Fighter): 11 Feb 1963-31 Dec 1969; 15 Jan 1971-1 Jul 1975. 932: 11 Feb 1963-1 Oct 1966. Squadrons. 45: 1 Jul 1975-1 Jul 1987. 46: 1 Jul 1975-1 Jul 1978. 71: 14 Apr 1959-11 Feb 1963. 72: 14 Apr 1959-11 Feb 1963; 1 Jul 1987-1 Aug 1992. 73: 14 Apr 1959-11 Feb 1963. Stations. Atterbury AFB, IN, 1 Jul 1949; Lawson AFB, GA, 23 Jan 1952-1 Feb 1953. Atterbury (later, Bakalar) AFB, IN, 1 Feb 1953-31 Dec 1969. Grissom AFB (later ARB), IN, 15 Jan 1971-. Aircraft. T-7, 1949-1952; T-11, 1949-1952; C-47, 1949; C-46, 1949-1953. T-6, 1953; T-11, 1953; C-45, 1953-1957; C-46, 1953-1957; C-119, 1957-1969; U-3, 1969. O-2, 1971; U-3, 1971; A-37, 1971-1982; C-124, 1972; A/OA-10, 1980-1987, 1992-1994; KC-135, 1987-; KC-10, 1987-1994. Operations. Trained as a Reserve troop carrier wing under supervision of the 2466th Air Reserve Training Center, Jul 1949-Feb 1951. Ordered to active service and flew airlift missions and participated in tactical exercises, May 1951-Jan 1953. Also provided C-46 combat crew training in support of Far East requirements, Sep 1952-Jan 1953. Trained as a Reserve troop carrier wing, Feb 1953-Oct 1958, using C-46s as primary training aircraft to Jan 1957 and C-119s thereafter. Began Air Reserve Technician (ART) program in Oct 1958 and soon began flying overseas missions. Went on one-month active duty in 1962 during the Cuban missile crisis. The wing in Jun 1969 converted one group to U-3A aircraft with a forward air control training mission but for only six months. Trained for special operations missions, 1971-1973 and for close air support missions, 1973-1987. Provided combat crew training in A-37 aircraft for USAF and friendly foreign nations until Jun 1980. Flew the bulk of fighter missions needed for forward air controller training at Patrick AFB, FL, 1975-Jun 1987. Provided A-10 tactical fighter training for reserve and guard pilots, Oct 1981-Jun 1987. On 1 Jul 1987 redesignated to an air refueling wing, absorbing the personnel, equipment, and worldwide air refueling mission of the inactivated 931st Air Refueling Group at Grissom AFB. The wing deployed personnel and equipment to Southwest Asia and to locations within the U.S. in support of operations in the Persian Gulf, 1990-1991. Since late 1993, periodically deployed personnel and equipment to Italy and other European locations in support of operations in the Balkans. Campaign Streamers. Southwest Asia: Defense of Saudia Arabia; Liberation and Defense of Kuwait. Decorations. Air Force Outstanding Unit Awards: 1 Sep 1988-31 Aug 1990; 1 Jun 1992-31 Aug 1993; 1 Sep 1994-31 Aug 1996. Republic of Vietnam Gallantry Cross with Palm: 14 Feb-11 Mar 1968. Bestowed Honors. Authorized to display honors earned by the 434th Operations Group prior to 1 Jul 1949. Service Streamers. World War II American Theater. Campaign Streamers. World War II: Normandy; Northern France; Rhineland; Ardennes-Alsace; Central Europe. Decorations. Distinguished Unit Citation: France, [6-7] Jun 1944. French Croix de Guerre with Palm: 6-7 Jun 1944; 20-28 Aug 1944. French Fourragere. Emblem. Approved on 27 Jun 1975; modified on 5 Jun 1995.